Hi friends! I'm so happy to be spending another on the Pinkfresh Studio Design Team! 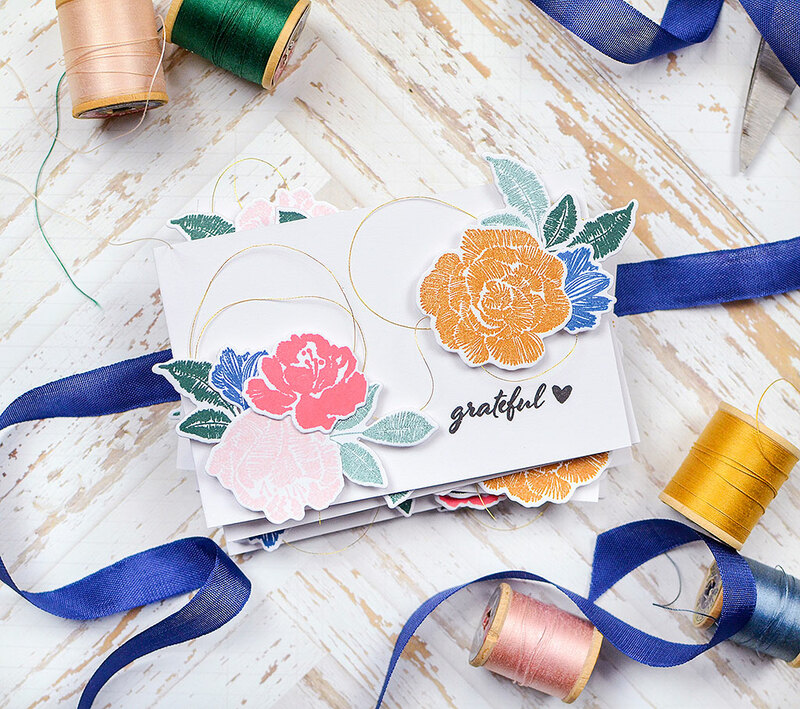 We had an awesome stamp and die release earlier this month and I'm still playing with those for this post (but I also had to get in one last card made with Indigo Hills 2 before the new scrapbook collections find their way to my studio desk). 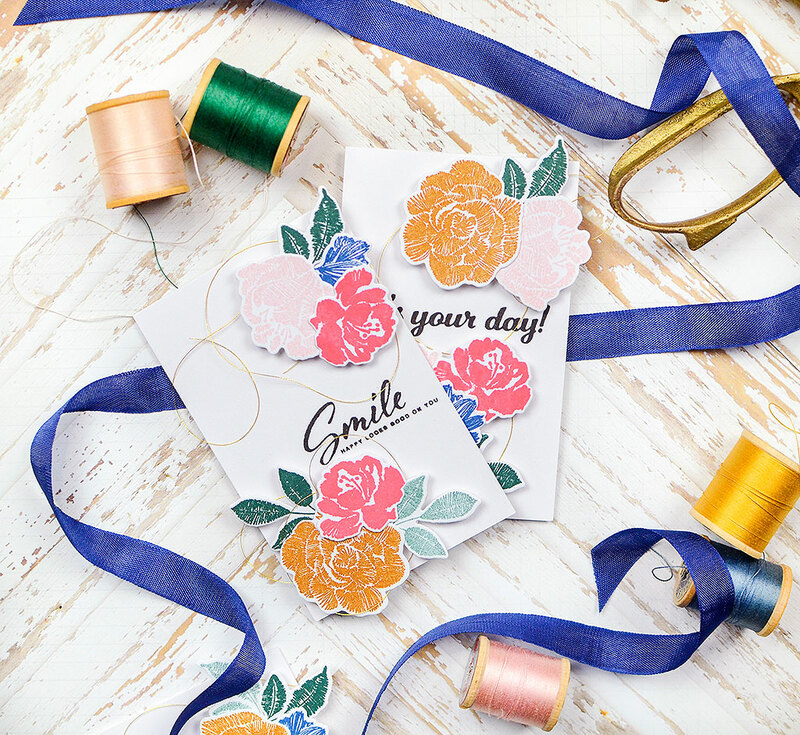 I think the gorgeous Embroidered Blossoms stamp and die set was a big favorite and I'm in love with it, too! I love it so much, I made a set of 5 mini cards with it. It was only supposed to be a card trio but I got a little carried away and added 2 more. When I started the project, I knew I'd need quite a few die cuts so I went ahead and stamped and cut them all out first thing. 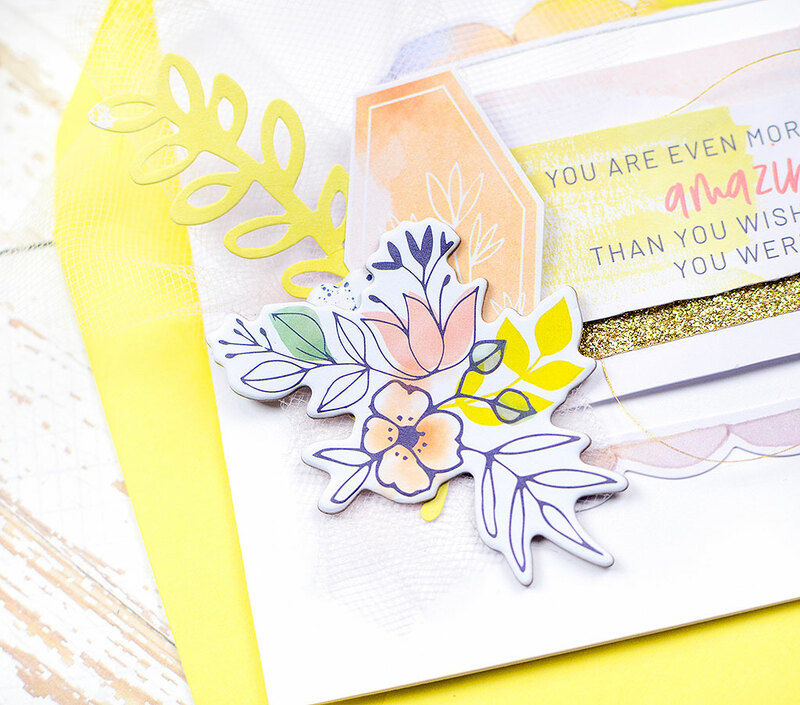 I chose a handful of blooms and leaves and stuck to stamping each design in one color. This helped simplify and speed up the process. My cards are 2 3/4" x 4 1/4" when folded and I played around with the placement of the different florals on each card. Once I had the layouts I liked, I went through the other new stamp sets to pick out sentiments for each card. 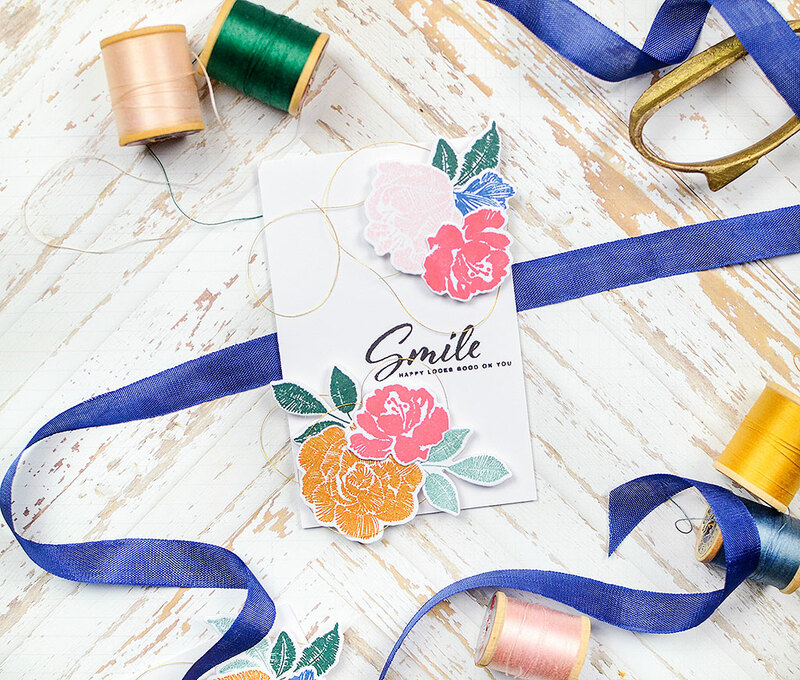 For the first card, I chose "Smile, happy looks good on you" from the Oval Foliage set. VersaFine black ink is my favorite ink for sentiments. It's a true black with a sharp finish. 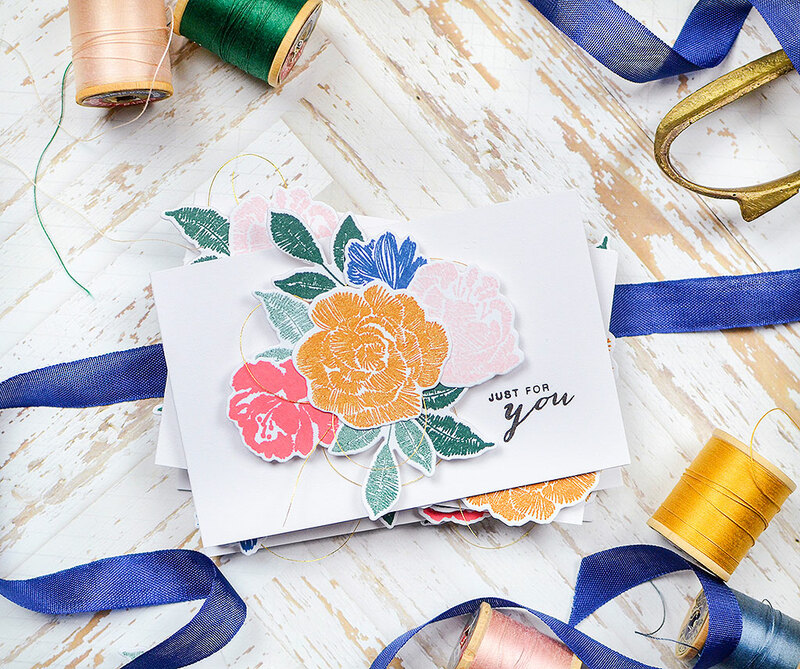 The placement is off-center, which works so well on a mini card, especially with the bold, beautiful florals. A little bit of my favorite gold metallic thread provides a tiny bit of texture. 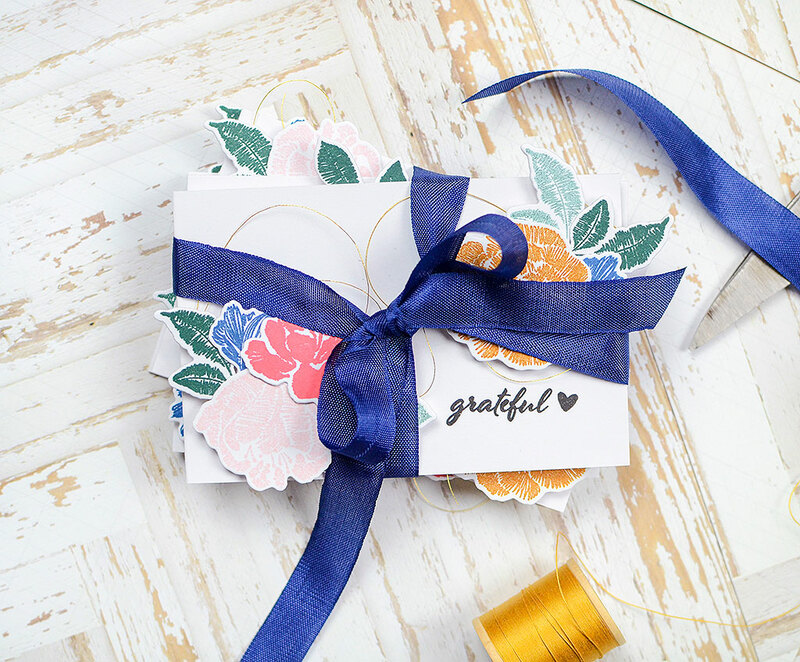 I stamped "grateful" on the next card, which is also from the same stamp set. 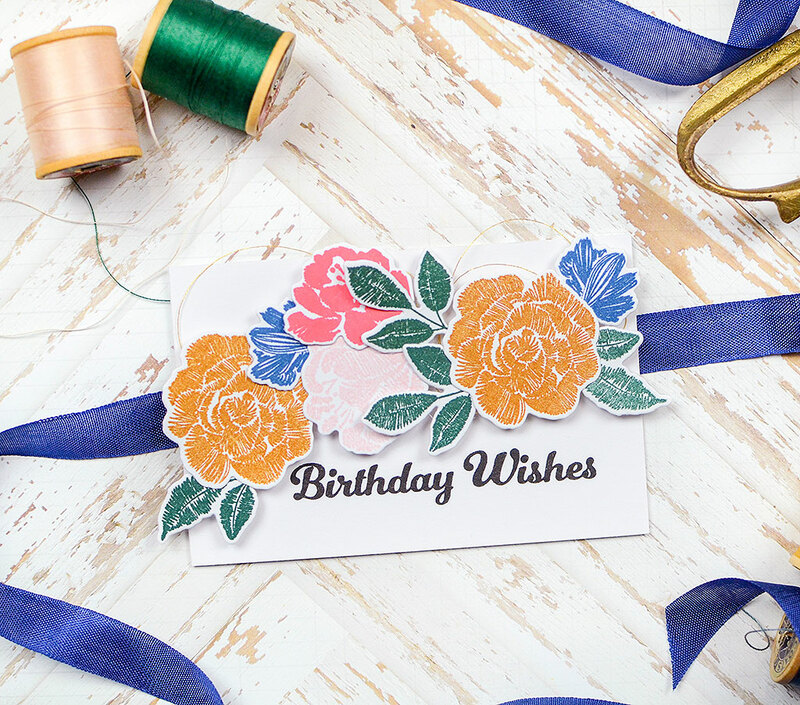 This card has a horizontal orientation, but features a similar placement of the flowers in the bottom left and upper right corners. 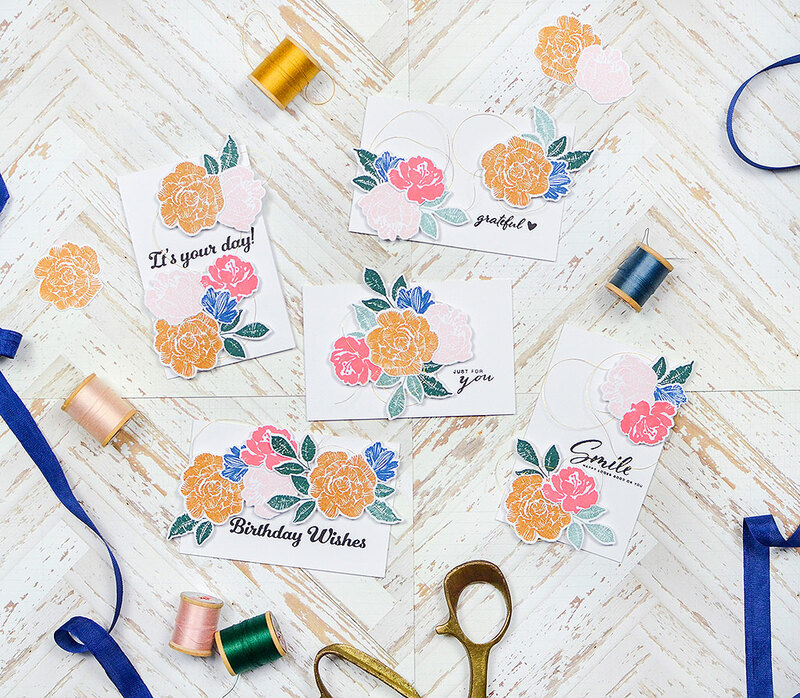 Each card has some of the same florals on it, but no two cards are the same. 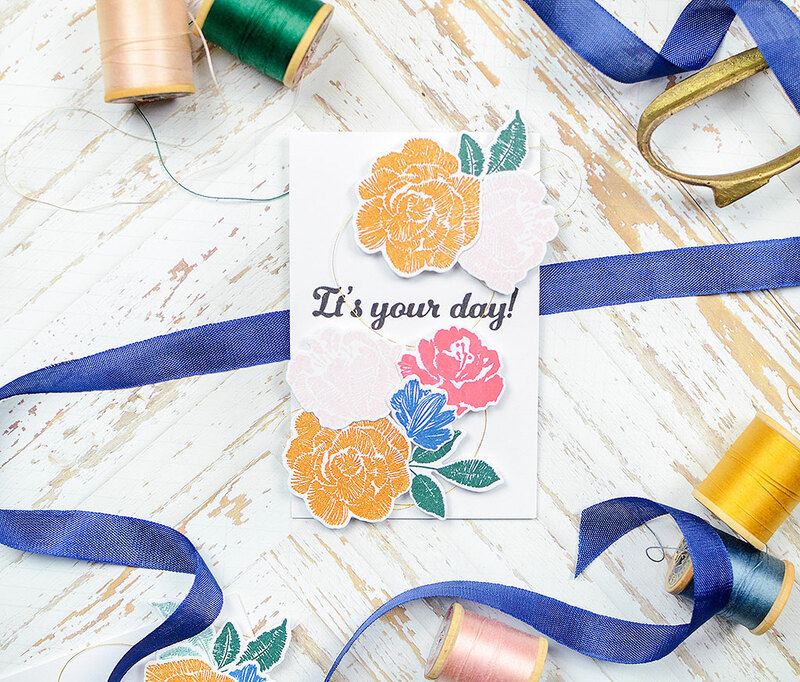 I wanted to use a lot of the blossoms on this card, and there was just enough room to fit "It's Your Day" in the middle. From the same Make A Wish stamp set, I've stamped the longer "Birthday Wishes" message across the bottom of this card. 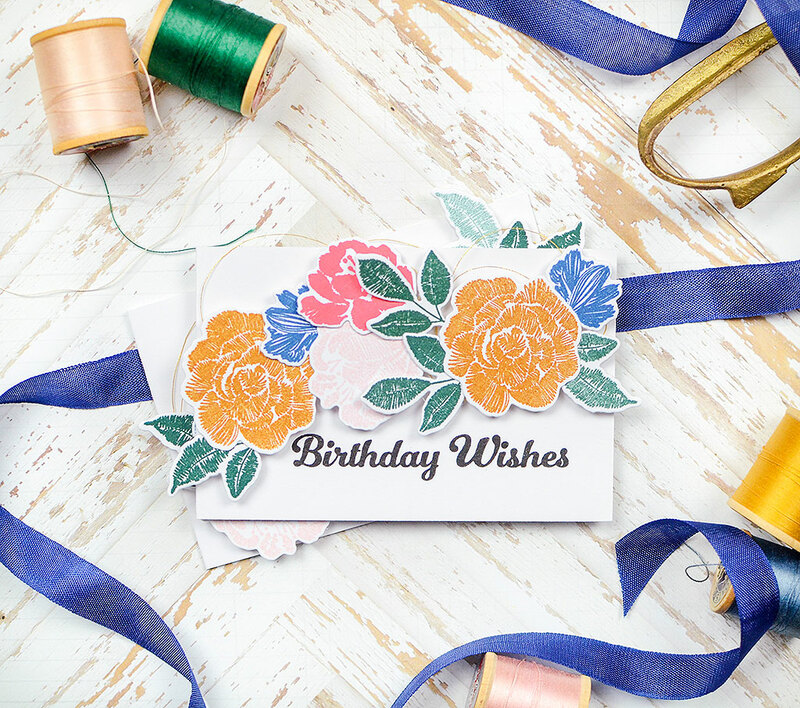 It takes up almost the entire length of the card, which meant I could decorate the top with lots of flowers, especially since it's such a celebratory card! The last card, which was #5 in the order I made them, is #1 on my list of favorites. I love the blooms taking center stage here, and the sweet "Just for you" tucked into the lower right corner. It's so simple, but sometimes, those are the best kind of card. 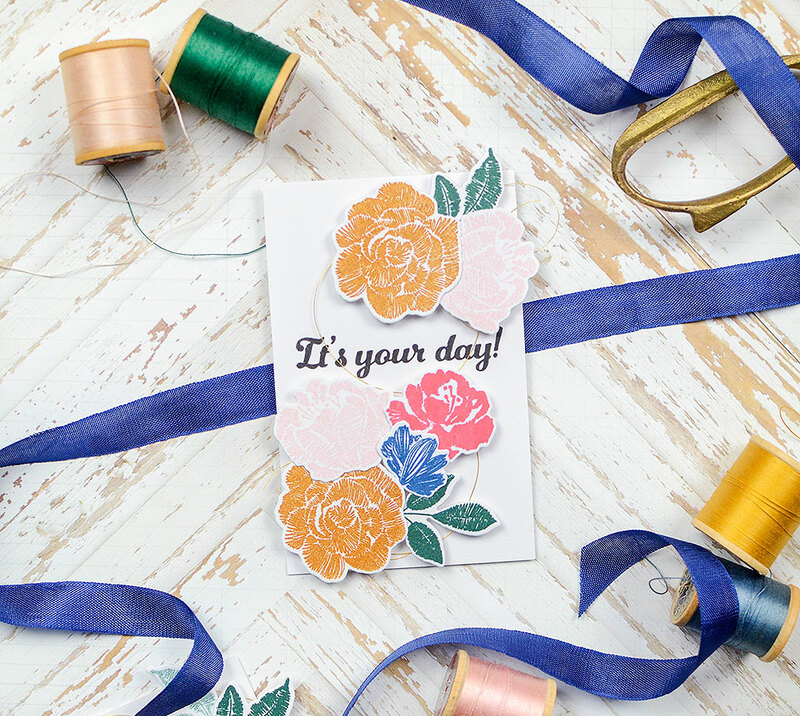 And speaking of simple, here's a simple way to wrap up a quick gift, making the card the gift topper as well. 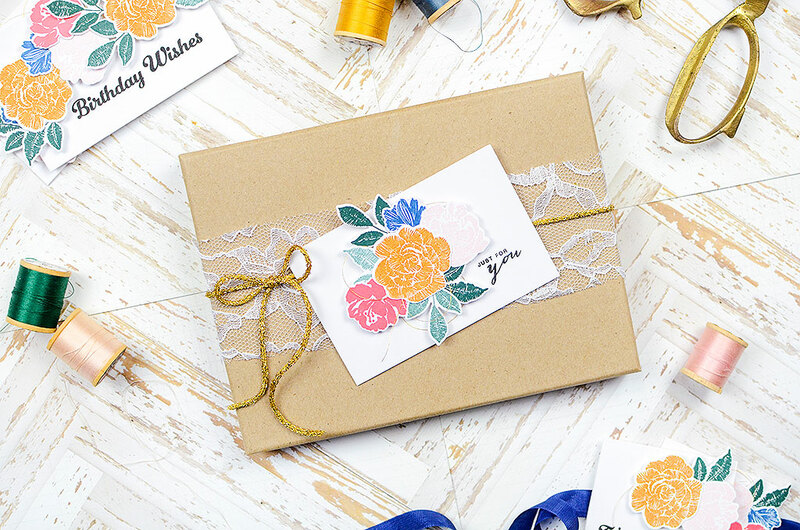 This plain kraft box looks so pretty wrapped in lace and gold cording. All I've done is lightly tape the card in place and it's ready to give. 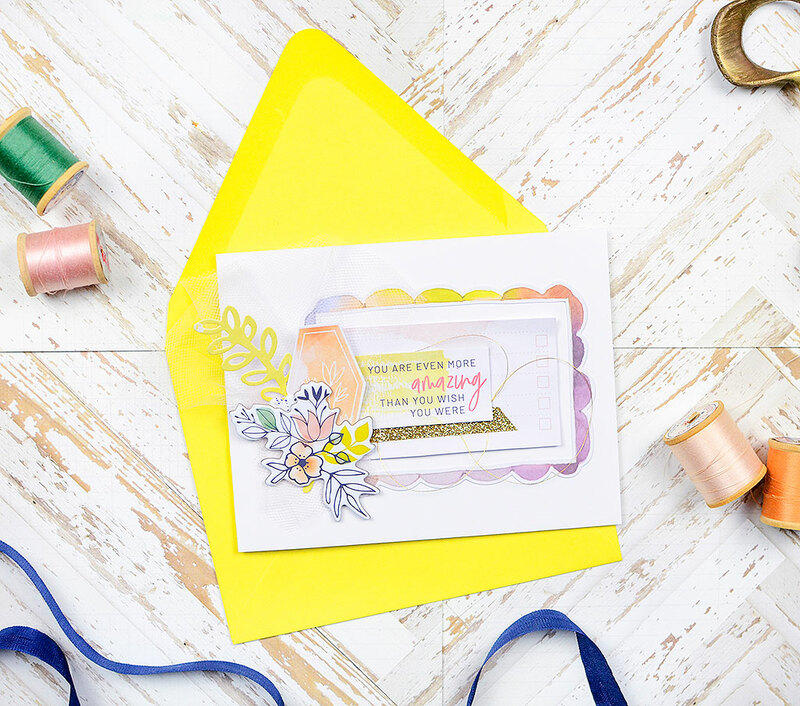 You don't always have to hide your card in the envelope--bring it out and put your hard work on display! I have a few cut blooms leftover so I see a few more of these minis in my future. I'll be happy to have them on hand to give out as needed; I'm sure they won't last long! I love digging into new paper and embellishment collections--the possibilities are so limitless and exciting. I'll be sad to shift Indigo Hills 2 from the front of the line, though, as it's been a favorite of mine, much like its predecessor, Indigo Hills. I brought the collection out again today to create another card with it. 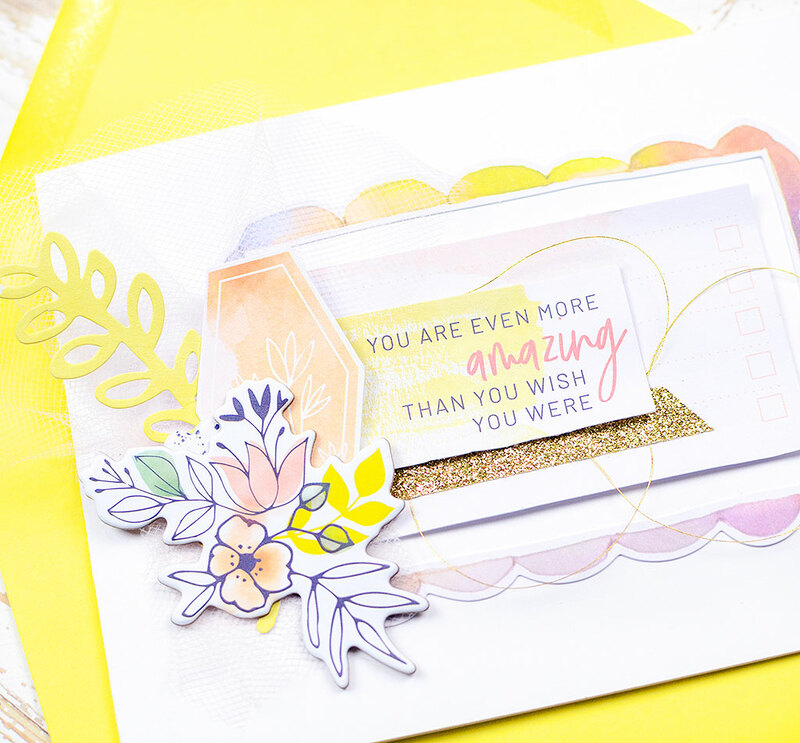 I was happily surprised to find a few die cuts that I hadn't used yet, like the scalloped watercolored frame and yellow branch, as well as the chipboard floral. They turned out to be just what I needed to kickstart this card. I used so many frames from IH2 on projects last year so I'll use the scalloped frame on this card. I placed it off-center and stuck a label inside, topped with an encouraging sentiment sticker. I gathered a swatch of pink tulle and arranged the yellow branch and an orange floral hexagon over it, topping it off with the chipboard bouquet and a puffy sticker heart. The colors here are so soft and pretty, making this a perfect greeting for a friend who needs a reminder that she's amazing. After this crafting session, I've got a nice batch of cards to add to my stash, which is a great feeling. Thanks for being here with me today; I hope you've been inspired!